Englewood is one of the 77 official community areas in Chicago, Illinois, United States. At its peak population in 1960, over 97,000 people lived in its approximately 3 square miles (7.8 km2), but the neighborhood's population has since dropped dramatically. In 2000, it had a population of approximately 40,000 inhabitants, and the 2010 census indicated that its population has further declined to approximately 30,000. Englewood is bordered by Garfield Boulevard to the north, 75th Street to the south, Racine Avenue to the west, and the Metra Railroad Tracks to the east. It is located on the southwest side of Chicago. Before the city of Chicago was established, the area that is now Englewood was largely swampland inhabited by Mascouten Indians. In 1839, the US Government Land Office of Chicago stated that the land was habitable. In the 1850s and 1860s, as Chicago was becoming a city of railroad tracks and economic prosperity, Englewood was just another supporting neighborhood. But in 1871, when the Great Chicago Fire destroyed a large portion of Chicago, residents moved to the outskirts such as Englewood. Englewood's railroad connections to downtown Chicago made it a convenient location, and the neighborhood's population grew rapidly. Englewood Station once served many railroad passengers; in 1889, over 1,000 trains would pass through Englewood every day. Hamilton Park founded in 1904 is located in the Englewood neighborhood. Englewood was the home of Dr. H. H. Holmes, one of the first publicized serial murderers in America. His hotel at Wallace and 63rd streets was the scene of most of his crimes and earned it the sobriquet "Murder Castle". The Englewood community was largely defined by the Englewood Shopping Center at 63rd & Halsted, a large pedestrian mall. The City, social services, and mall management worked with community leaders and groups to integrate the mall with the community. The goal was to make the mall a vital part of the community, and a central part of everyday life. It was the site of numerous community events, parades, outdoor concerts, live radio broadcasts and the like. This was spearheaded by the Englewood Business Men's Association and its director, Richard Drew. Mr. Drew died in 1978, and with his passing the Association lost its community focus. The Center subsequently lost its major anchor tenants, including Sears Roebuck, and became a collection of smaller merchants. In 1999, Mayor Richard M. Daley announced a $256 million revitalization plan for the area. The keystone of the program is the relocation of Kennedy-King College to the former site of the Englewood Shopping Center. Shortly thereafter the city began an aggressive buyout and relocation program for mall merchants. The campus includes the Washburne Culinary Institute. Groundbreaking for the new, 40-acre (160,000 m2) campus occurred on November 9, 2005, and it opened in 2007. Digital images of Englewood can be found in Explore Chicago Collections, a digital repository made available by Chicago Collections archives, libraries and other cultural institutions in the city. Based on census data collected by the city of Chicago in 2008-2012, the poverty rate for Englewood is 46.6% of households below poverty and 28% of people 16 years of age and older are unemployed. In 1960, Englewood had 67,216 black people and 51,583 white people; black people made up about 69% of the residents in Englewood. At the time most black people resided around 63rd Street. At the time the median income of Englewood was $5,579 ($47,248.92 according to inflation). By 1980, the total population was 62,069, a loss of about 30,000 people in two decades; 99% of the people were black, and the white population was down to 818. Edward McClelland of NBC Chicago stated "Not even ethnic cleansing in the Balkans achieved the levels of turnover that white flight in Chicago did." Both the Chicago Transit Authority's Red Line and Green Line run through Englewood, as does the Dan Ryan Expressway (I-90 and I-94). The railroad junction at Englewood, where Metra (the former Rock Island) crosses Norfolk Southern (the former Pennsylvania) has long been a cause of delay. In March 2010 a $133 million reconstruction project was announced which improved operations by replacing the diamond crossing between Metra and NS with an overpass for Metra. The project proposed by Chicago Region Environmental and Transportation Efficiency Program (CREATE) was completed in 2014. Chicago Public Schools operates public schools in the neighborhood. Paul Robeson High School is in Englewood. In addition to Robeson, Hope High School and Dyett High School serve parts of Englewood. A small section is zoned to Hyde Park Academy. Englewood is home to Johnson College Prep, a Noble Network charter high school. Team Englewood Community Academy and Urban Prep Academies Englewood Campus is operated in the Englewood High School building. Englewood High School was opened in 1873, but closed due to poor performance in 2008. Englewood is home to Kennedy–King College. Chiraq by Spike Lee is set in Englewood. Takin' Place by Cyrus Dowlatshahi was filmed in Englewood. Harold L. Ickes, 32nd United States Secretary of the Interior (1933-1946). He moved to Englewood as a child and attended Englewood High School. Morgan F. Murphy, member of Congress from Illinois's 3rd congressional district. He graduated from Leo High School. Derrick Rose, basketball player for the Minnesota Timberwolves, former NBA MVP, former player for the Chicago Bulls, New York Knicks, and Cleveland Cavaliers. He was raised in Englewood. ^ a b c d "Community Data Snapshot - Englewood" (PDF). 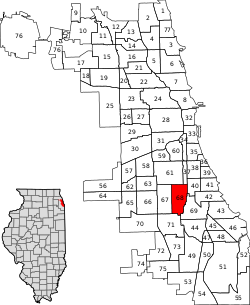 cmap.illinois.gov. MetroPulse. Retrieved November 29, 2017. ^ "Chicago History Encyclopedia: Englewood". ^ "Brief History of Englewood". chicagoreporter.com. 2009-07-12. Archived from the original on 2009-05-31. ^ "Washburne Culinary Institute Homepage". Archived from the original on January 12, 2010. Retrieved 2010-01-02. ^ "Mayor Daley, Community Leaders Break Ground For New Kennedy-King College Campus". Public Building Commission of Chicago. November 9, 2005. Archived from the original on 27 October 2014. Retrieved 6 October 2013. ^ "New Kennedy-King College". Public Building Commission of Chicago. Archived from the original on 5 June 2013. Retrieved 6 October 2013. "Mayor Daley cut the ribbon to open Kennedy King College on July 18, 2007." ^ Demographics from Metropolitan Planning Council. By Josh Ellis. Published 2009. Data taken from year 2000. ^ "Englewood | City of Chicago | Data Portal". Chicago. Retrieved 2016-02-16. ^ a b "A Brief History of Englewood". The Chicago Reporter. 2007-10-01. Archived from the original on 2012-11-13. Retrieved 2017-01-10. ^ McClelland, Edward (2013-05-06). "White Flight, By The Numbers". NBC Chicago. Retrieved 2017-01-10. ^ Vance, Steven. "Englewood Flyover broke ground today – will save 7,500 hours of Metra delays annually". Grid Chicago. Retrieved 11 November 2011. ^ "Englewood." City of Chicago. Retrieved on January 11, 2017. Compare this map to the CPS maps. ^ "South" (elementary school zones). Chicago Public Schools. July 19, 2013. Retrieved on January 11, 2017. ^ "contact". Paul Robeson High School. Retrieved on Retrieved on October 21, 2009. ^ "West Central South" (high school zones). Chicago Public Schools. July 19, 2013. Retrieved on January 11, 2017. ^ "Far South" (High School Zone Map). Chicago Public Schools. February 8, 2013. Retrieved on January 11, 2017. ^ a b Hope, Leah (July 18, 2007). "New billboards tout Englewood neighborhood's success stories". ABC7 News (WLS-TV/DT). Retrieved 2013-10-29. ^ Drake, David (2012-10-17). "Growing Up in Chicago and Getting Noticed". Complex. Retrieved 2015-02-07. ^ Mobius, Joseph B. (August 1, 1959). "Chapter III The Early Years". The propaganda philosophy of Harold L. Ickes (PDF) (Thesis). Boston University. Retrieved December 26, 2018. ^ Austen, Ben (17 September 2013). [Public Enemies: Social Media Is Fueling Gang Wars in Chicago "Public Enemies: Social Media Is Fueling Gang Wars in Chicago"] Check |url= value (help). Wired. Retrieved 6 October 2013. "Chief Keef and Lil JoJo, two rappers from the South Side neighborhood of Englewood..."
^ Graydon, Megan (March 10, 2016). "Morgan Murphy Jr., former congressman, dies at 83". Chicago Tribune. Chicago, Illinois. Retrieved June 24, 2017. ^ Jensen, Sean (May 14, 2011). "Derrick Rose keeps tough Englewood area close to his heart". Chicago Sun-Times. Retrieved August 4, 2014. Wikimedia Commons has media related to Englewood, Chicago.